Meditative, artful, and transporting. In a way, the experience of seeing Asia in Bloom: The Orchid Show is much like ikebana, the traditional Japanese art of flower arranging. 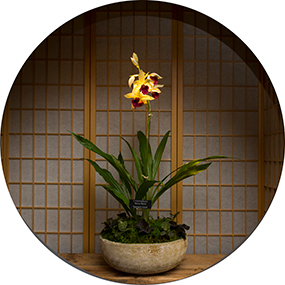 On display now through March 25, this new feature of the Chicago Botanic Garden’s Orchid Show invites you to pause and reflect on this historic art form. Ikebana is the traditional Japanese art of flower arranging. The practice of ikebana (ee-kay-bah-nah), also called kado (or, the “way of flowers”), dates back approximately 600 years. Originally, men and women arranged flowers as Buddhist offerings for altars at temples. Since then, ikebana has established itself as an art form beyond religious ritual, and is often seen displayed in people’s homes. Though it is now a secular practice, ikebana carries deep philosophical meaning. When arranging flowers in the ikebana style, the arranger is invited to remain silent. The silence creates a meditative space for the artist to connect with and appreciate nature more closely. For ikebana floral designer and Garden volunteer Shelley Galloway, the connection between nature and person is key. “Love of nature, the desire to convey the inner essence of the plant material, and the ability to give a personal interpretation reflecting the artist’s own view of the world are all important components of ikebana,” said Galloway. Although ikebana designs can be created with all kinds of flowers, the designs on display at this year’s Orchid Show feature the main event: orchids. The art of ikebana is more than simply putting pretty flowers in a vase. 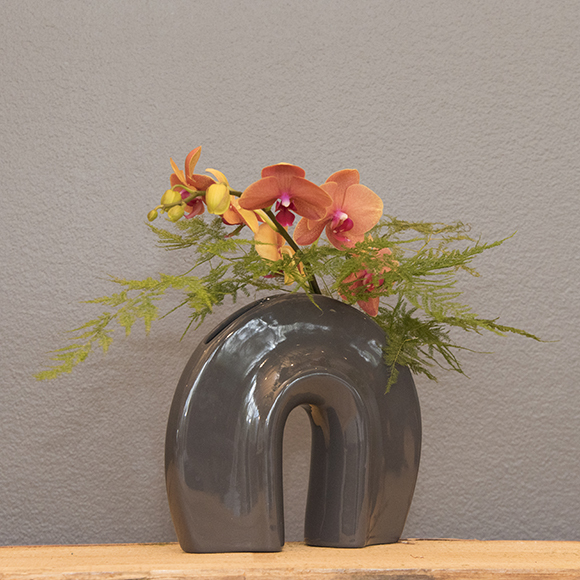 Ikebana is known for its distinct asymmetrical style and the use of empty space. Attention to harmony and balance is key, as in many other traditional Japanese art forms. Ikebana is also customarily taught by a teacher, who instructs you how to insert flowers into a base or container. Harmony and asymmetry are hallmarks of the ikebana style. 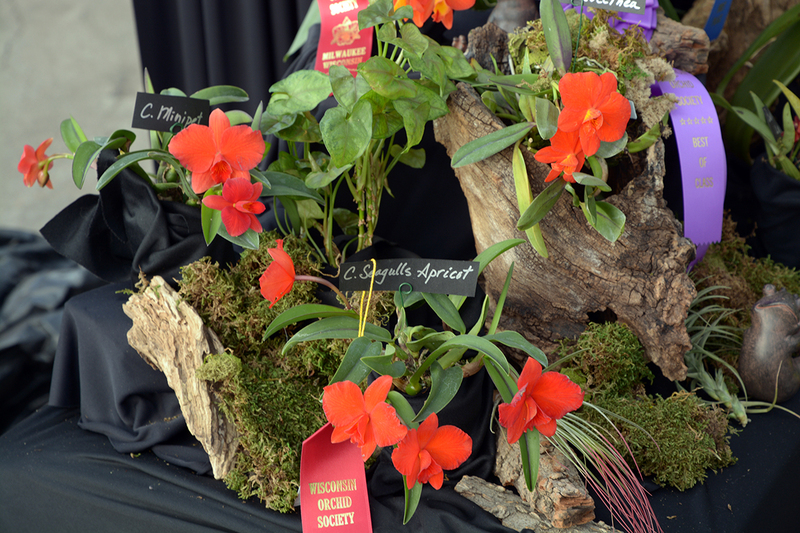 At the Orchid Show, artists from three schools, or styles, of ikebana created the compositions on display. The arrangements reflect balance and the beauty of nature, as interpreted by the schools of Ikenobo, Ohara, and Sogetsu. Ikenobo —The oldest school of ikebana, Ikenobo is based in Kyoto, Japan. It features classic and contemporary styles, and observes the belief that flowers reflect the passing of time. Ohara —The Ohara school of ikebana focuses on the natural world. It emphasizes seasonal changes, and invites its students to observe nature and the growth processes of plant materials. Sogetsu —The Sogetsu school considers ikebana a practice accessible to people of all cultures—not only Japanese. It aims to spread appreciation of the art form all over the world. The Chicago Botanic Garden celebrates this timeless art form at three ikebana shows annually. 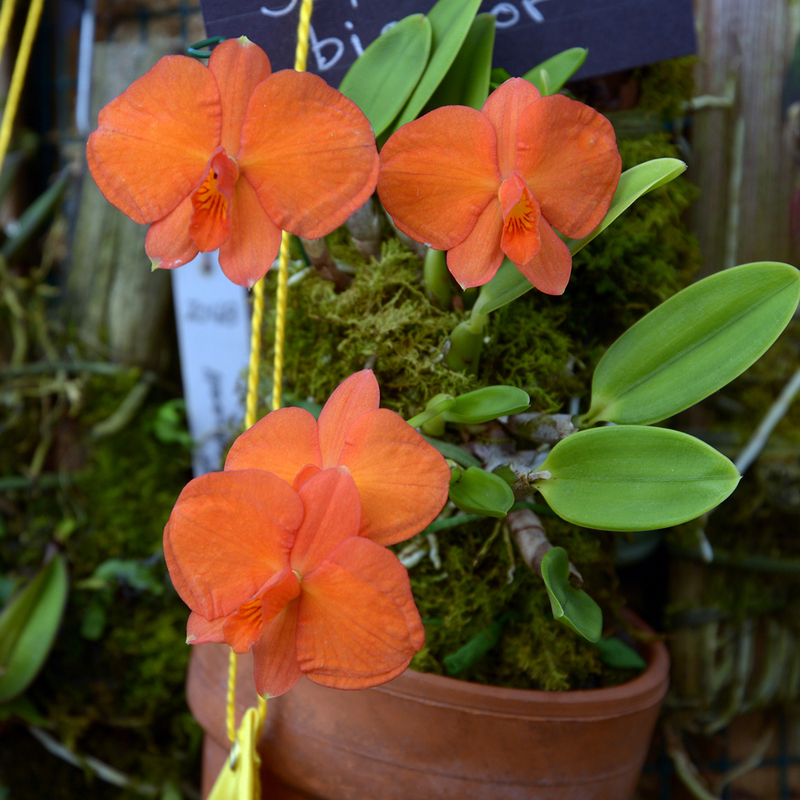 The first show is happening now at the Orchid Show, through March 25. The Ikebana International Exhibition will be held June 23 to 24, 2018. The Ikenobo Ikebana Chicago Chapter Show will be held August 25 to 26, 2018. The Sogetsu School of Illinois Ikebana Sogetsu Exhibition will be held September 8 to 9, 2018. See Asia in Bloom: The Orchid Show daily from 10 a.m. to 4 p.m.; join us for our final Orchids After Hours on March 15 and 22, from 4 to 8 p.m.
Drop by the Chicago Botanic Garden’s Lenhardt Library to see rare book illustrations of hand-colored orchids in Asia that give a new perspective to Asia in Bloom: The Orchid Show. Of all the rare orchid books in the library’s collection, it’s a challenge to select illustrations for an exhibition to complement the Garden’s annual Orchid Show. Since the Orchid Show is so colorful, featuring 10,000 orchids in bloom, we usually try to showcase things that really pop. And although there are some extraordinarily colored illustrations in the library’s free rare books exhibition Asian Orchids Illustrated, I wanted to focus on the scientific and historical aspects of the works. Displayed in the first case of Asian Orchids Illustrated is a rare 1874 volume of Japanese physician Yokusai Iinuma’s botanical encyclopedic compendium, Shintei Somoku Zusetsu. It features a partially hand-colored illustration of the orchid Cypripedium japonicum, which can be found in China, Japan, and Korea. The plant has been used in China to treat malaria, snake bites, and lower back pain. Also featured are three oversized tomes of the Annals of the Royal Botanical Garden, Calcutta, featuring partially hand-colored orchid plates by Indian artists and lithographers. 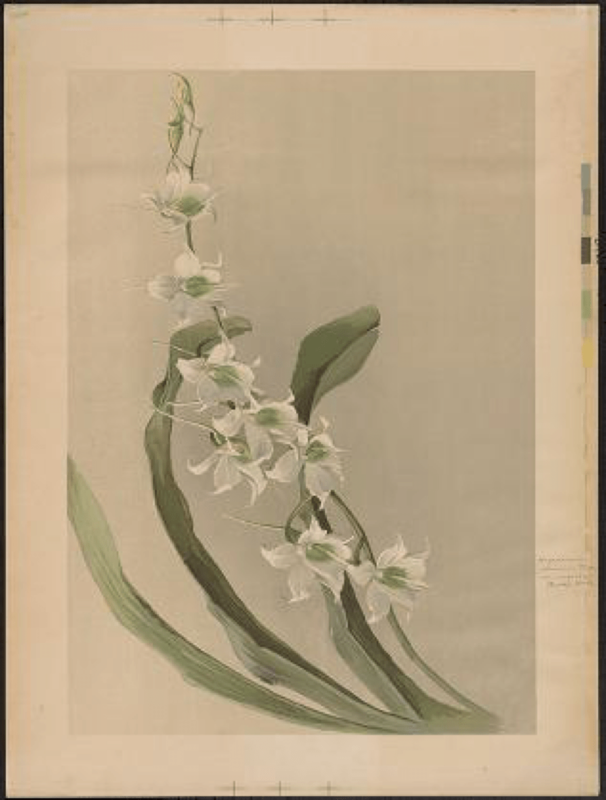 The orchids featured in this case are Dendrobium densiflorum; the leaves are ground into a paste and used for bone-setting in India, and Goodyera biflora, which is used for tuberculosis, as an anti-inflammatory, and for snake bites. And finally, the third case contains six different volumes showcasing the interesting history of the Rothschild slipper orchid, often claimed to be one of the most expensive and sought-after orchids of our time. This poor orchid has been through the proverbial ringer, so to speak. Not only has it had its name changed without being consulted, from Cypripedium Rothschildiana to Paphiopedilum Rothschildianum, but it has been often mistaken for other species of orchids, has been misrepresented by collectors, and has had its bloom time genetically modified. Lastly, but most importantly, it has been to the brink of extinction. On display at the Orchid Show is a hybrid Paphiopedilum that’s related to the Rothschild’s slipper orchid. On Sunday, February 25, and Tuesday, February 27, the Lenhardt Library hosts a free talk at 2 p.m. about these extraordinary books that contain orchidaceous history on their beautifully illustrated and typeset pages. After the talk, you will be invited to view a few more “orchid-delectables” in the library’s Rare Book Room. The hand-carved Buddha is in the house. A circa-1850 glazed Chinese jar is filled with green Cymbidium orchids native to Asia. And we’re pampering 10,000 other orchids so they’ll be in full flower for Asia in Bloom: The Orchid Show. Lighting crews, horticulturists, and dozens of other staff members are putting the finishing touches on Asia in Bloom: The Orchid Show, the Chicago Botanic Garden’s biggest flower exhibition of the year. 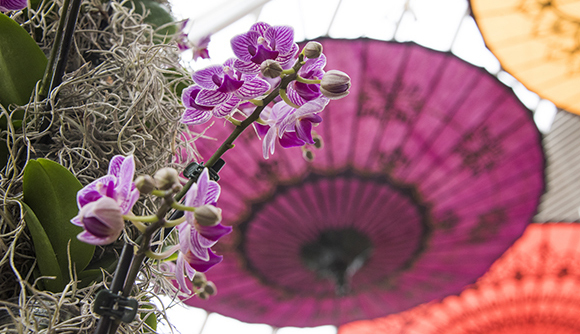 The Show features sweeps of orchids native to Asia, blooming with color and scent. In our heated greenhouses and galleries, the exhibition runs February 10 to March 25 and kicks off with a Members’ Preview night on Friday, February 9. 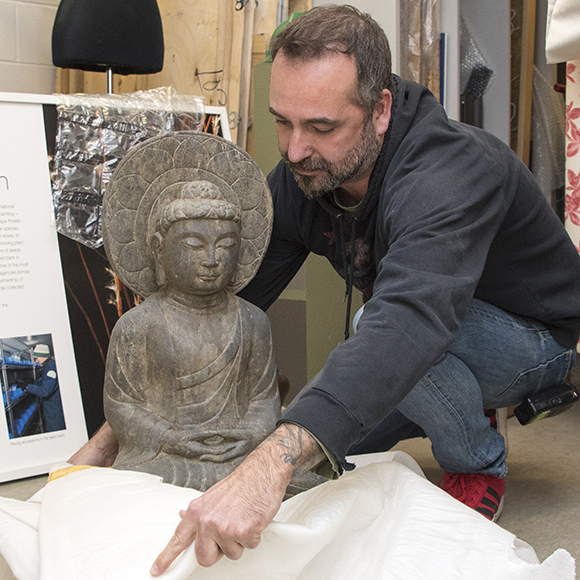 A circa-1900s hand-carved Buddha, on loan from Pagoda Red, is being prepared for display. In parts of Asia, such as Myanmar, orchids are used as offerings to Buddha. This year’s Orchid Show is infused with a deep sense of history and culture, thanks to our friends at Pagoda Red galleries in Winnetka and Chicago. Pagoda Red loaned us many lovely items—including the circa-1900 Buddha and vintage glazed jar from Shanxi province, China—that helped us bring the theme Asia in Bloom to life. You’ll see Pagoda Red’s pieces throughout the Show, as grace notes to the stories and legends we’re telling about orchids in Asia. The narrative includes fairies, native headhunters, and the secret ingredient (we cannot vouch for this, sorry) in love potions. 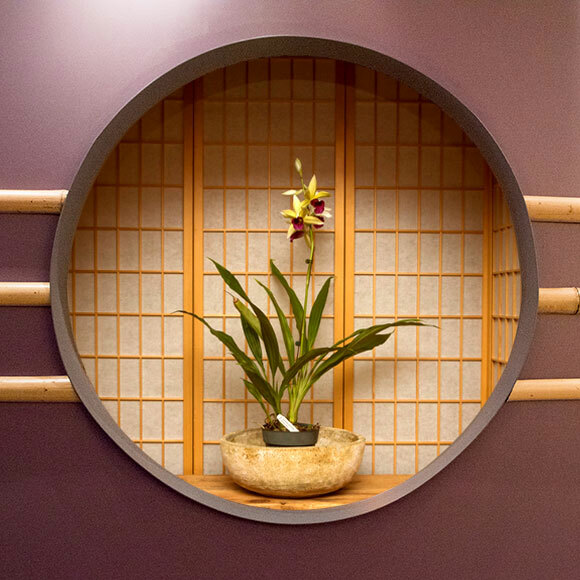 This idea for an entryway was inspired by a modern Japanese tea house. 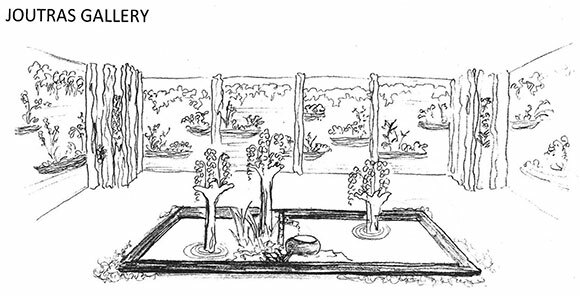 It started with a sketch by Gabriel Hutchison, the Garden’s exhibitions and programs production manager. Gabriel Hutchison’s Japanese tea house sketch illustrates his concept for the show. 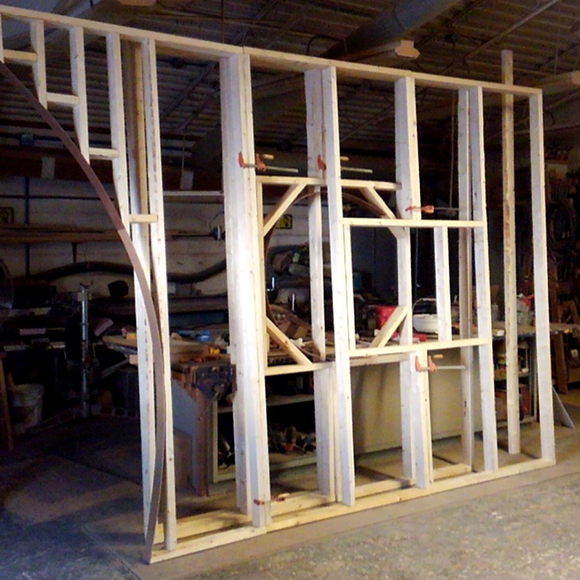 Carpentry supervisor Andy Swets built a frame for the tea house and constructed the finished walls. A recessed panel in the frame will house a “window” featuring orchids. It took three crew members two days to get the rolled bamboo walls just right. 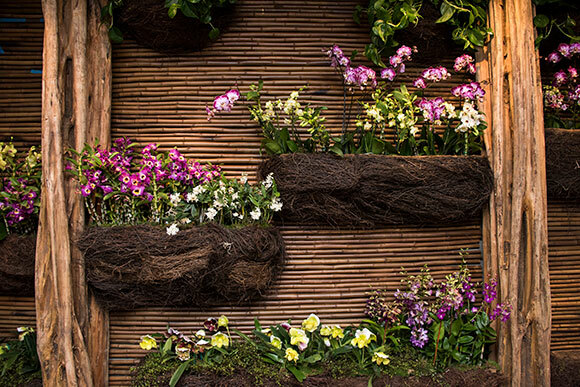 The finished walls support moss baskets filled with orchids native to Asia in the Joutras Gallery. Meanwhile, our horticulturists are keeping a close eye on the 10,000 orchids, each of which has its own water, humidity, temperature, and light requirements. New this year is a display of the graceful Japanese flower arrangements known as ikebana, with orchids as the focus. Also new is Orchids After Hours on Thursdays, from 4 to 8 p.m., with Asian beer, sake, sushi, poke bowls, and other light fare for purchase. 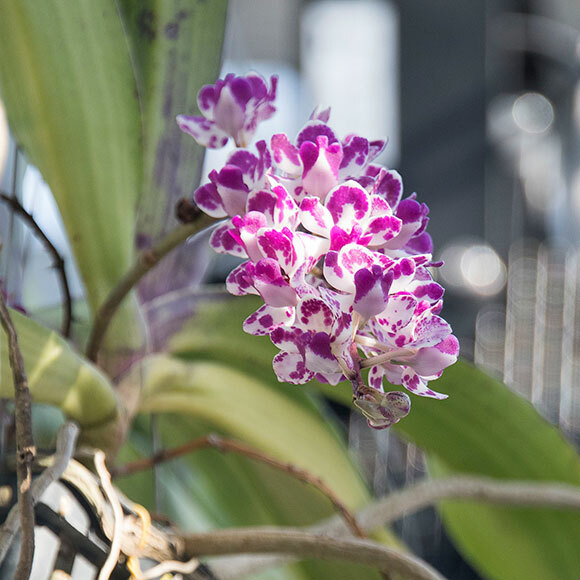 This Rhynchostylis orchid, native to the humid forests of India and Southeast Asia, was kept in our new orchid house at 60 degrees Fahrenheit so it wouldn’t bloom too early. Remember that the look of the Orchid Show changes throughout, as new orchids come into bloom and the ikebana displays change. And the Semitropical Greenhouse? You’ll get a different view each time, depending on the angle of the winter sun as it shines through the patterned parasols on to the orchids. While we are in the midst of the exquisite Orchid Show, the Garden is already planning a summer of Brazil in the Garden, highlighting the influence of Brazil on gardens, arts and culture, and conservation. This seems like a great opportunity to publicize some Brazilian orchids that have been among my favorites all the years I have grown orchids at home. Cattleya orchid (Cattleya coccinea) and hybrids from the Wisconsin Orchid Society Show on February 26, 2017—my plants! Brazil has one of the highest diversities of orchid species of any country in the world, with more than 2,500 species reported, and no doubt many more undescribed species from the botanically unexplored interior. If you enjoy orchids at all, you have already seen Brazilian orchid species or the hybrids derived from them. Just a few of the well-known orchids that are indigenous to Brazil are many of the Cattleya species as well as many of the former Sophronitis and Laelia species now included in Cattleya; also species from Epidendrum, Maxillaria, Miltonia, Oncidium, Phragmipedium, Stanhopea, and others. The national flower of Brazil—Cattleya purpurata (formerly Laelia purpurata)—is also an orchid. The native orchids of Brazil are often epiphytes growing on trees and shrubs, but can also be terrestrial, and even lithophytes (growing on rocks). They can be found from hot and humid lowland tropical areas, to seasonally dry and cooler interior regions, to high elevations in cloud forests. 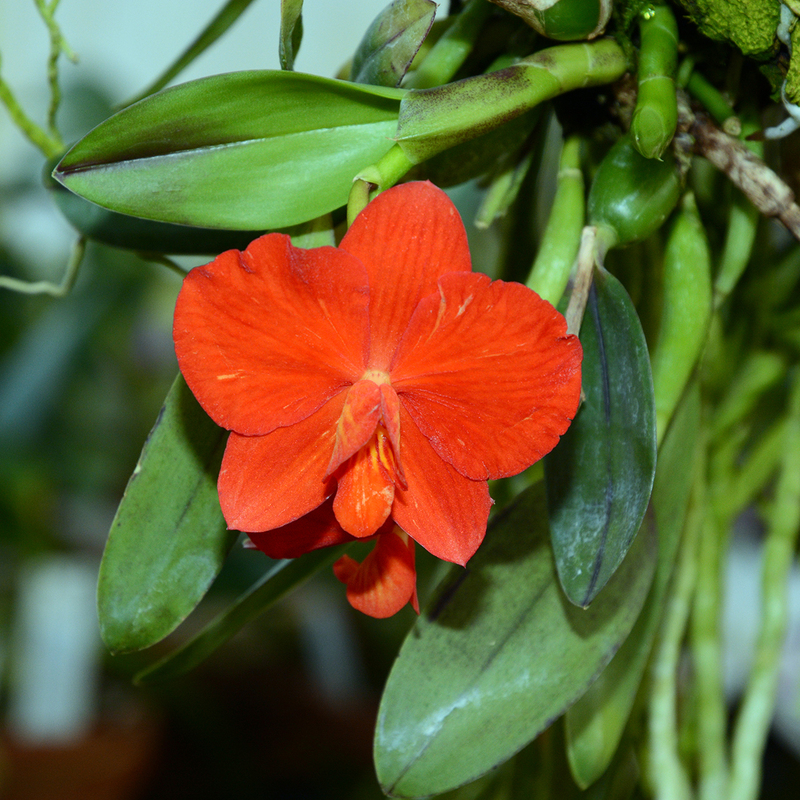 The care of Brazilian orchids and their hybrids in cultivation is as varied as the number of species and their habitats, but where they naturally occur provides clues for how to grow them in cultivation. Luckily, the vast orchid literature available often includes information on their culture. Which brings us to Cattleya coccinea, the compact—yet brilliant—jewel of my orchid collection. Formerly recognized and still more commonly referred to as Sophronitis coccinea, C. coccinea is one of perhaps six to nine species and as many varietal color forms included in the former genus Sophronitis. While all the species are delightful in their own right, C. coccinea is the best known. It has long been grown, line-bred (crossed within the species) to improve it, converted to tetraploids (double the typical number of chromosomes) to produce plants with even larger flowers, and especially used in breeding to impart large bold flowers on compact plants. Literally thousands of orchid hybrids have C. coccinea lurking in their background. But I prefer the species or hybrids that are at least 25 to 50 percent C. coccinea, and so still bear a strong resemblance to the species. Cattleya coccinea is a diminutive grower, with cylindrical pseudobulbs less than 1 inch tall, each topped by a solitary leaf all of 2 to 3 inches in height. A clue you are giving your C. coccinea sufficient light is when each leaf has a red stripe on top of the mid-vein. Under my growing conditions, C. coccinea can produce flowers any time from November to May, and will often bloom two or three times in succession. One to two flowers are produced per new pseudobulb. The flowers can be from 1 to nearly 3 inches wide in the best forms, dwarfing the plant. Flowers are a brilliant red to orange-red with some yellow and/or orange in the small lip. Look for forms with flat flowers and broad overlapping petals. They are always a draw in bloom. Related species are less frequently encountered. Cattleya cernua (Sophronitis cernua) has much smaller flowers but produces more per growth, is very vigorous, and tolerates warmer summer temperatures. There are yellow-flowered versions of both C. coccinea and C. cernua, but these are very hard to find and are priced accordingly. 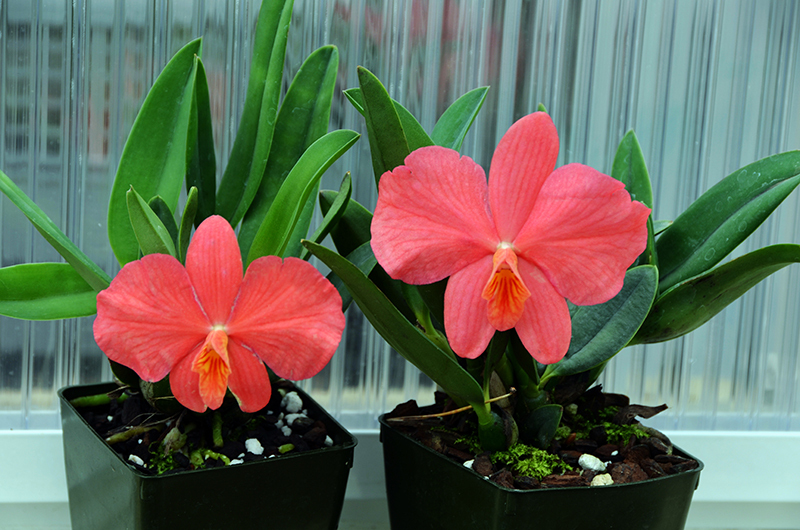 Cattleya wittigiana is similar to C. coccinea but with attractive rosy-pink flowers instead. It has been put to good use in breeding. Confusingly, C. wittigiana is also known as C. rosea, Sophronitis wittigiana, and Sophrontis rosea. The other species are rarely seen. The former Sophronitis species are not for beginning orchid growers. But with attention to their cultural preferences, they can thrive in the hands of experienced orchid growers. I adore them for their interesting foliage, dwarf habits, and their vibrant and glowing flowers that dwarf the plants. Look for their easier-to-grow hybrids as well. The Chicago Botanic Garden does not have any of the former Sophronitis species in its collections (I’ll work on that), but there is a good chance that at least some of the species, or hybrids from them, will be on display at the Illinois Orchid Society Spring Show, held March 11 and 12 here at the Garden. The IOS show, which is layered on top of the Garden’s Orchid Show, will include numerous exhibits, judging of the best plants, multiple vendors with plants and growing supplies for sale, an information desk, and a repotting station. Also, look for Brazil in the Garden in our many gardens and events this summer. Each year’s Orchid Show at the Chicago Botanic Garden features something new and dynamic—and each year, the Lenhardt Library’s Orchid Show exhibition showcases something rare and dynamic. Free Talk on Sunday, February 26, at 2 p.m. 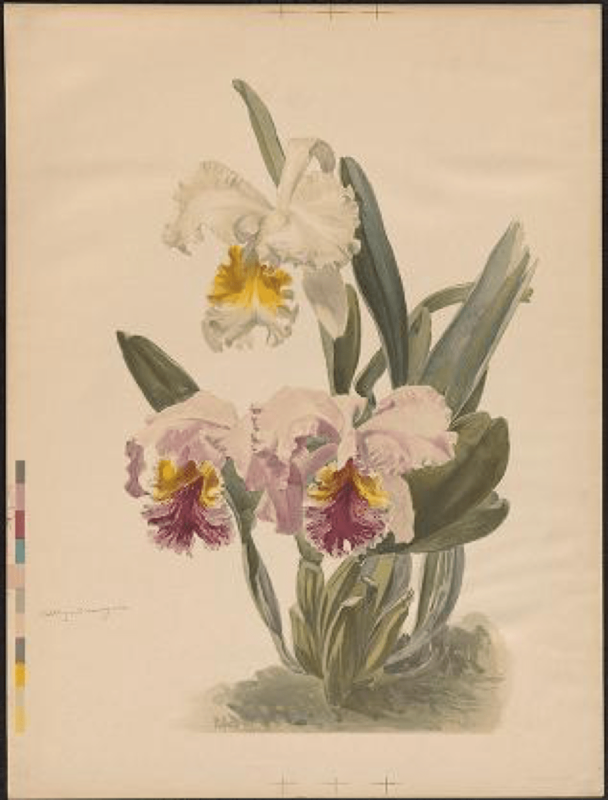 This year’s exhibition, Orchidpalooza: Illustrated Orchid Varieties, features five unsigned, untitled, and unnumbered artist proofs that are attributed to English landscape artist Henry Moon (1857-1905). 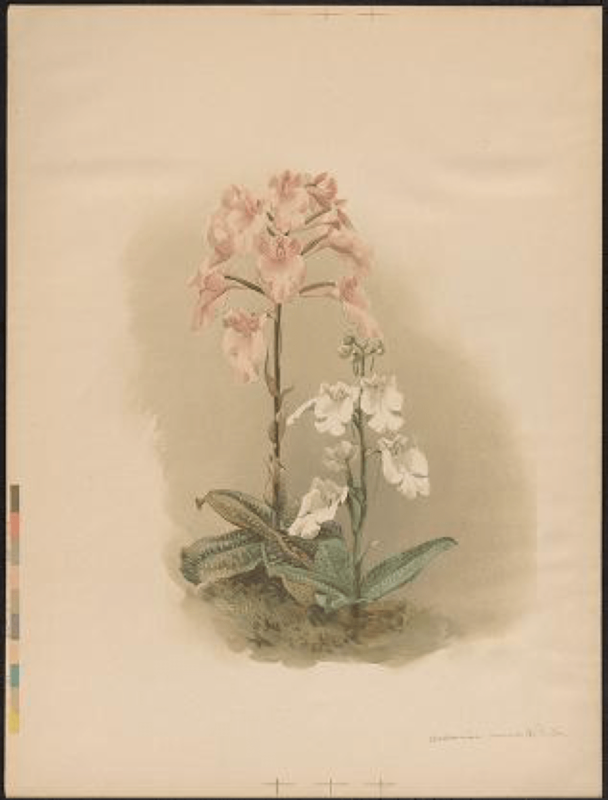 The proofs were most likely intended for a third series of a collection called Reichenbachia: Orchids Illustrated and Described, commissioned by Frederick Sander (1847-1920). Moon was Sander’s son-in-law and was responsible for the 192 chromolithographs published in the monumental two-volume work. This work is considered Sander’s homage to Heinrich Gustav Reichenbach (1824-90), the “Orchid King” who succeeded John Lindley (1799-1865), the “Father of Orchidology,” as the leading orchid authority of the late 1800s. 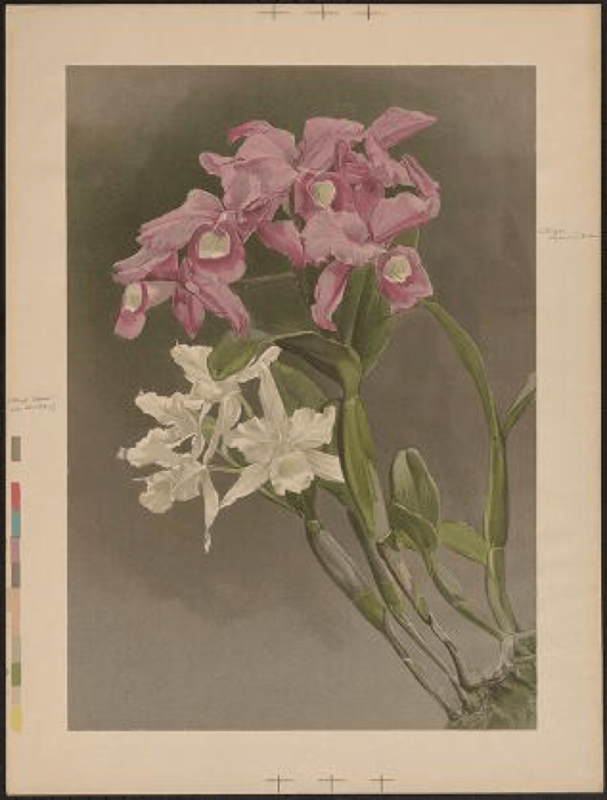 Never before exhibited in the Lenhardt Library, the five botanically accurate orchid chromolithographs include color bars from eight to twelve colors, registration marks, and scientific names penciled in the margins or on the verso. See the Orchid Show through March 26. Buy tickets here. Any views, findings, conclusions, or recommendations expressed in this blog do not necessarily reflect those of the National Endowment for the Humanities.